I had backed up the red Rambler American in the darkness so the passenger door was even with the sidewalk leading to the front porch of the girl I was excitably in love with at first sight. The key slowly turned causing the motor to quiet. As I pushed the door open, the interior light above my head came on. Quickly I made my way out the door and shut it with a silent clunk. I didn’t want the light to give me away. 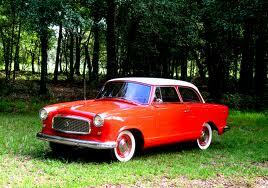 The Rambler, equipped with make-out seats and a necking-knob on the wheel, sat stealthly silent on Lynwood. I slowly popped open the trunk’s lid. The street light behind me a couple of houses away exposed the interior. Aluminum cans were strewn about, left there from the Friday night before at the Rodeo Drive-In with a few of my friends. Buckhorn beer in those days was only $2.99 a case and my buddies and I made sure we always had enough for the entire group to get buzzed. I grabbed out several handfuls of the empties and walked up the path on tip-toes. I began to build the monument. Stacking cans in a pyramid shape on her sidewalk leading up to her Mom’s door seemed like a good idea at the moment. Feeling it wasn’t tall enough, I went back for more. I covered my mouth so no one could hear me laugh as I adored my accomplishment in architecture. The lamp’s glow, nearest the window in the living room, lit up the shear curtains and it appeared no one was home but I knew her and her Mom, who I had yet to meet, were inside. They were always home this late at night as I had known her for a least two months and I had all the important details tucked securely in my beer-ladened brain. The Rambler coughed one time as I slowly pulled away from the tall curb leaving the Stack-of-Cans Memorial for all to view and drove home. I would see her tomorrow morning as I had asked her to go to breakfast on Sunday. Morning came filled with the anticipation of having breakfast with her made me hurry to get dressed and out the door. I backed out of the dirt driveway and sped toward my soon-to-be girlfriend’s house, smoke trailing from the blackened exhaust pipe. Turning the corner onto Lynwood I noticed the beautiful sculpture of cans were no where to be seen. I smirked a smile from the corner of my mouth knowing she must have gotten a kick out of my surprise. I slowed the car to a stop and popped out the key. I rounded the front of the red sedan and looked up in the air and around to my left and right, wondering where the sound I could hear was coming from. I could see her standing inside the screen door watching me approach. The eerie music was getting louder and I turned my head back to the car to see again, where was it coming from. Later in life I would find out it was the theme from Jaws. I turned back to the door as I walked and could see her slowly shake her head. An arm crossed in front of her and opened the screen. That’s the moment I met my match, her Mom, and she didn’t appear to be very happy. That’s the moment I met Ann. From that point on, Ann did not appreciate me very much. She knew there was going to be trouble in Dodge if her daughter and I began to get serious. We both were nearing the age to jump from the nest. She had a worried look on her face everytime I came over to see Kim or to take her out to the movies. Over time Ann did start to warm up to me a little bit but catching us making out in the living room one night, when she was supposedly going to walk down to the store, did nothing to help my, ‘Like Me Scoreboard’, which was already deep into the negatives. Ann had a significance about her. A single mom, raising three children working as a short order cook at the hospital down the street with just enough money to pay the bills and eat. No car, no fancy clothes, no luxuries. Ann never missed a day of work. Ann never missed a payment of any of her debts. Although short in stature, Ann carried an enormous yet invisible stick. I feared Ann in a loving way. Ann had a bad back from all the years bending over a griddle and it caused her to hunch over a bit. Her hair was always perfect. She would wear one of those nets on her head at night so that when she woke up she’d just take it off and get dressed. I remember a smell of hair spray being thick in the house. When she was upset at me for something I said or for just breathing, she would look over her chain-secured glasses and try to burn me with her stare. I swear she could burn you like a wood burning set if she wanted to. Ann didn’t drink, gamble or swear. I never told her about the track as I figured she think I was a gambler and think I was Mafia or something distasteful. Her only vice was smoking and a few moments of enjoyment in drinking a cup of coffee at her kitchen table. Ann did one other thing and she did it extraordinarily well. Ann could cook. Man, could she cook. Ann too was the self-appointed warden of my life’s prison and she made sure I always knew it. After a couple of years of Kim and I staying serious, Ann actually acted as if I was tolerable. Then Kim told her of our intent to marry one year after high school was over. That went over like pouring hot water on a lemon meringue pie. She told me on the phone that her Mom was not very pleased with our theory of happiness and that maybe I shouldn’t come over today at all. So I did. When I went inside, I could hear Ann in the kitchen opening the drawer filled with forks and spoons. The drawer closed a tad harder than normal as I imagined her appearing in the doorway with butcher knives in each hand. She walked through the living room without even a hello. I knew now I should not speak. Kim put her finger against her pursed lips and shook her head. So I did. “Hi Ann,” I cheerfully said. She walked down the hallway and into her bedroom. Stopping halfway, she leaned back just enough for me to see one glaring eye below her permed hairdo’s bangs and over her glasses. I could hear her stare sizzling. “I think you should go now,” Kim warned. So I sat down. Flopping onto the couch, I crossed my leg over my knee. I raised my arm, resting it on the cushion next to me and took in a deep and relaxing breath. I think I sat there on the couch for around two weeks before Ann finally talked to me and then it was only to say something under her breath that had the word, “Riddance,” in it. My dog was not in this fight and since Summer was ending and our Senior year was about to start, I had other more important worldly matters that needed my attention so I left. Ann’s hardness in her attitude toward me stayed that way until Thanksgiving. Kim invited me to eat with them after I ate my Mom’s Bohemian white plate of white food so I accepted. I knew the food was going to be outstanding at Ann’s house. I gobbled up the slab of white meat of the turkey and the white potato dumplings slathered in white gravy my Mom had made then hopped into the Rambler to go enjoy some finer dining on Lynwood with Chef Ann, Kim the dishwasher, the Grandpa with real teeth and the beloved Gramdma. Ann had a formal dining room in her small historic home and when I got there the table was set and Grandpa was seated at the head of the table. Ann was putting plates of wonderous foods on doilies and coasters around the table. Her infamous, sweet tea, in her infamous sweet tea glass pitcher, sat to one side. For some strange reason, the taste of her sweet tea with her Sunday afternoon dinner of chicken fried steak and mashed potatoes is one of those little things I will remember for a lifetime. A dried flower arrangement centered the feast. Grandpa leaned and looked at me as I sat down. “How ya doing?” he asked. I knew what his next response was before I said mine as Grandpa always said the same thing and only said two things all the time. “Oh pretty good,” I baited his next question. “Pretty good or good and pretty?” he asked and then chuckled at his response. He made himself laugh every time. The man was 92 and I saw him and Grandma almost every day I was at Kim’s house. They lived just down the street and Kim had to walk down every morning and give Grandma a shot of insulin for her ravaging diabetes. If it wasn’t at his house or when he was at Ann’s house, he would always ask me the same thing after his patented greeting as he cracked a piece of ice in his mouth with his real teeth. He’d nod and move onto someone or something else. I didn’t bring my glove on purpose because if I was the one exercizing the old man and he dropped dead, Ann would stab my eyes out with the corner of her glass ashtray. The five of us sat down to eat and finished after Ann brought out the delicious made-from-scratch pumpkin pie with real whipped cream. We began to clear the table and out of kindness I said I would help with the dishes. So I did. I told Ann to help me hold her arms down so she wouldn’t hurt herself and for Kim to hold her legs. I grabbed her chin and forced it open wider and reached into her foaming mouth and pulled out the dislodged denture from her throat. She took in an enormous breath and instantly calmed down. “Call an ambulance,” I told Kim. She rushed to the hanging princess phone to make the call. “Was she choking?” Ann asked me, still hysterical from seeing her Mom in such distress. Grandma’s eyes were still focused toward one point above me. I knew she was having a stroke as I had seen it on the track before. “Ann, you stay right here and if she begins to choke, lean her forward and reach in with the towel to wipe out the spit. Kim, hand me the towel. It’s right there.” Kim nodded as she hung up the phone then picked up the towel and stood next to her Grandma. Grandpa was still seated and hadn’t moved. He looked as if he was in shock. I opened the screen and went down the two steps to the concrete path knowing she wasn’t going to ever be the same again. A fire truck with four fireman rolled around the corner with lights and sirens as I came up to the curb. I waved to them and they stopped in the middle of the street and hurried out of the truck. “I think she’s having a stroke. She’s 90 years old,” I said to the first fireman. He trotted up the walkway and into the house followed by the rest of the men. The ambulance approached and I followed them in. Inside, the firemen were working on Grandma. They put her on the gurney and rushed her to the ambulance. The fireman was talking to Ann as she was making gestures about her Mom’s teeth and pointed at me in the doorway. He said something to her and Ann looked at me again and smiled. Ann loved me from that day on. For the next 8 years, I enjoyed the best food, the best advice, and the best stories Ann had to offer. She was always there for us and our first born. When Ann got sick from cancer, she never let it stop her from being positive. When she found out we were having another baby, Ann said she would not die before seeing the child. Our daughter was born while Ann was in a home for the very ill late in September. Kim took the baby for her to see although the disease had ravaged her body terribly. Kim told me I should come along to see her Mom and that she doesn’t look like Ann as I knew her. “Come on, you’ll want to see her. She’s so looking forward to see the baby.” So I didn’t. I should have. I remember the late night phone call while we were sleeping. Ann had left us on Halloween. This Thanksgiving went off without a hitch and Kim was now in the throngs of her Christmas get-together which by the way was female only. I helped get the camp ground in the back ready, split three stacks of wood for the fire pits. I checked and rechecked the outdoor heaters, raked up the ground, and made sure the Christmas lights in the trees were lit so everything would look good for the dignitaries who were coming. Kim was inside preparing all kinds of food and drink. I watched her work and I could see the anticipation of a great time in her eyes. Sunset had approached and the first ring of the doorbell anounced to us one of Kim’s guests had arrived. I was about to leave and go have a beer at the bar on the corner so the girls could be girls, besides all my manly stuff was done. I ran toward the hallway to see Kim on the ground clutching her wrist and forearm. She looked up at me and said, “It’s bad.” I asked to see her arm. She was right, it was bad. She had shattered her forearm when she tripped into the door just as she was about to open it. I lept into action again, helping her secure the twisted arm and rushed her to the hospital and after surgery and a three day stay, we were about to be discharged. Kim had asked our daughter to bring some clothes for the ride home and a shirt she could wear over her perfect cast covering her perfect arm. The doctor said it was perfect about ten times so we assumed it was perfect. We joked about the perfect doctor. I came into the room to see Kim seated on the bed ready to go and waiting for me. She had on a reddish-brown patterned long sleeved shirt. “Where’d ya get that?” I asked inquisitively. I recognized the shirt but it had been so long, 30 to 35 years ago, that I had seen it. I paused in recollection and knew how this moment in my life will be forever remembered. A blue man of sorts for me, even though it was just a shirt when I wore it. There ya go, another little thing I will always remember. The shirt fit Kim to a tee. I noted this because I was wonderstruck as to how skinny I used to be before my body counter-attacked my brain for the years of me consuming beer and food thus providing me with girth. Kim and I returned home to spend the next few days with her as she itched her way out of the pain medication and into what some days could only be described as being in a ‘foul’ mood because of the cast and the constant uncomfortableness while the bone mends itself. We sat enjoying coffee this morning and shared small talk about what we were going to do for the rest of the day. Kim had on the special shirt. I told her how important that shirt is now and how touching it was to me to see it being so important to my daughter. It will be something she will always have and that it gave me great comfort knowing it gives her comfort when she needs it. I told her I missed Ann a lot because of all the great things she had made for me even though she never really appreciated the effort I took when building the aluminum Pyramid of Doom. Kim shook her head just the same way as she did so many years ago. We both agreed that Ann’s chicken fried steak with gravy and mashed potatoes on Sunday afternoons could never be beatened. The dish was that perfect. “You know,” Kim broke in, “it’s not the big things that always matter in one’s life but it’s always the smallest ones that will jump out and bring you the most comfort,” she continued. “It’s kind of funny but one of the biggest regrets I have after she died, is my Aunt Marie wanted to have something small but significant to remember her by so I took her into the garage where we stored all of her stuff. “What was it,” I asked then took a sip of the coffee while my questioning eyes peered over the cup’s rim. “Not a picture picture, the pitcher,” she motioned her hand as if she was pouring. 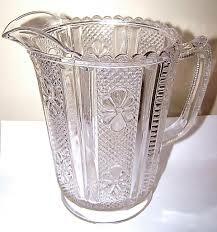 “My Mom’s pitcher. You remember, don’t you?” she quizzed, clutching closed my daughter’s special reddish-brown shirt with one hand as she held her hot cup of coffee with the other. A comforting memory of a taste instantly crossed over my taste buds. I slowly nodded, envisioning the unique glass vessel filled to the brim with exceptional flavor made from the heart by a truly remarkable and unforgettable woman. I placed my cup down and said two very soothing words as Kim sat smiling with her feet warmly tucked aside, with my shirt held close to her chest. We remembered together as I spoke the words of comfort. Oh the sweet memories of loved ones gone on forever. My husbands Dad was noted for many things but two that stand out the most were his love of his grandkids and his unflappable sense of humor. I can picture in my mind him walking around with a toddler holding to one finger and a baby in his other arm, laughing at himself for some comment or joke he had just made. Your story just brought back all those wonderful memories. Thanks. Great read & great memory! You never stop making me smile when I read these stories, it seems like yesterday when I was pouring a glass from that special pitcher. That was a great story. I always enjoy your stories. I love your stories. Hope Lady Tater continues to heal.